By incorporating different forms of light into his monumental sculptures, Matthew’s artwork takes on unusual dimensions and added brilliance. 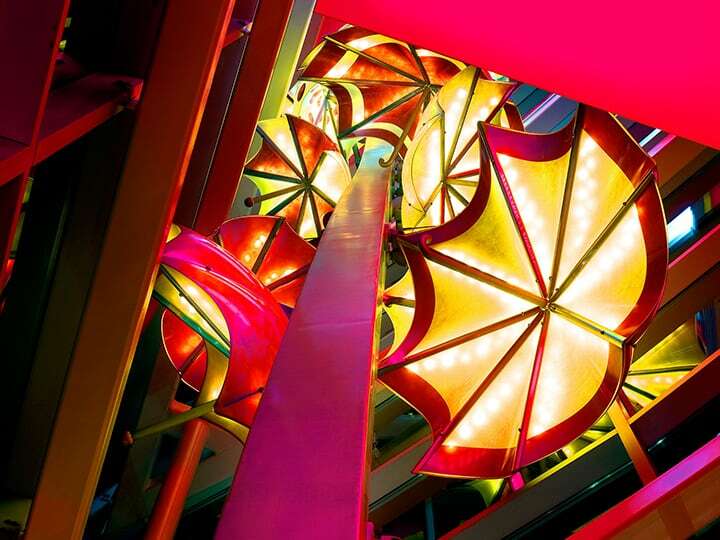 “Imagine,” a 90-foot tall installation at Children’s Hospital in Omaha, Nebraska, is an example of his masterful use of state-of-the-art lighting. Nineteen colorful umbrellas that float up the hospital’s glass-enclosed stairwell constantly change hues, thanks to 3,500 programmable LED lights that are capable of more than 16 million color combinations. “Spirit,” a multi-faceted sculpture located at the Children’s Hospital at the Oklahoma University Medical Center, also dazzles with innovative lighting. The sculpture features a dozen six- and seven-foot-tall stainless-steel kites with multi-colored acrylic panels. The kites, powered by 2,500 LED lights, glow vividly at night and create an illusion of drifting in the breeze. Natural sunlight also figures into many of Matthew’s creations. One such project is “Harmony,” located in the healing garden at Immanuel Medical Center in Omaha. Consisting of a 14-foot chime surrounded by an 18-foot-long butterfly screen, sunlight shines through bright acrylics, creating colorful shadows on the ground.